This is an absolutely phenomenal berry. It has been used for centuries all across Europe for many ailments. Its primary use was for respiratory track infections and for “loosening” dry cough to be able to cough up the phlegm. As such it was used as an expectorant. It is not clear what the active compounds in Elderberry are but one thing is for sure, whatever they are they are strong immune-stimulants. Immuno-stimulants are simply compounds that stimulate the immune system. 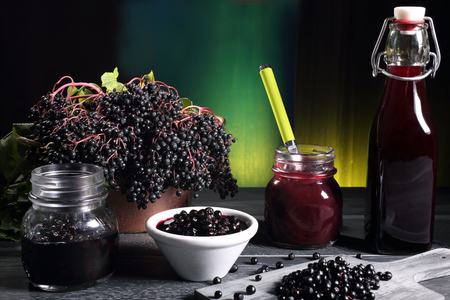 Numerous very well designed human studies have shown that Elderberry reduces the symptoms of viral flu by about 60% compared to placebo. That’s from an average of 6 days of flu to merely 2 days. This effect has been shown to be effective for both type A and type B flu. The other important point about this fruit is that it is packed with anti-oxidants. This is not one bit surprising as the fruits resemble a cluster of grapes on a tree and have a dark purple color when ripe. I say this because barriers in general have a high content of anti-oxidants and the general rule (with a few exceptions) is that the darker red or purple they are the more their anti-oxidant content. Such anti-oxidants are very beneficial to the cardiovascular system and the heart as they protect the small arteries and capillaries from oxidative damage which may eventually lead to arterial plaque formation and blockage of blood flow. They are not only beneficial for the heart and the circulatory system but also prevent the ageing of skin, wrinkle formation as well as slow down the aging process in general. We can say that anti-oxidants are beneficial to every single organ system by helping in their proper functioning and preventing oxidative damage…..Read More….. Categories: Antioxidants, Immunity, Pain Relief, Superfoods | Tags: black elderberry, heart, lozenges, raw foods | Permalink.